These properties have already been published as a section in the server HTTPInboundXMLBindService.properties file. You will now add properties for the iiiPRO06_request and iiiPRO06_response services. Note: If your project did not already contain this information, by opening the server on your project tab and then using Retrieve Section on the Instance / HTTPInboundXMLBindService.properties file, you can retrieve this properties section into your project Integrator / properties folder. 2. You will refer to the properties editor shown above as Properties Editor (1). b. 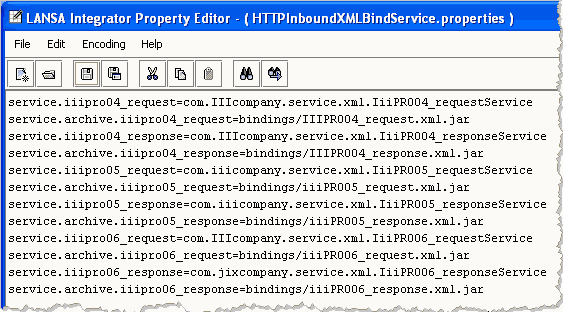 Open the HTTPInboundXMLBindService.properties in Server XML Employees Response folder and copy this code to Properties Editor (1). Close the second editor. d. Save your changes and exit the Properties editor. e. Right click on your local HTTPInboundXMLBindService.properties file (in the left panel, in Integrator / Properties) and select the Publish Section option from the pop-up menu. A message will ask you to confirm publish. Select Yes. 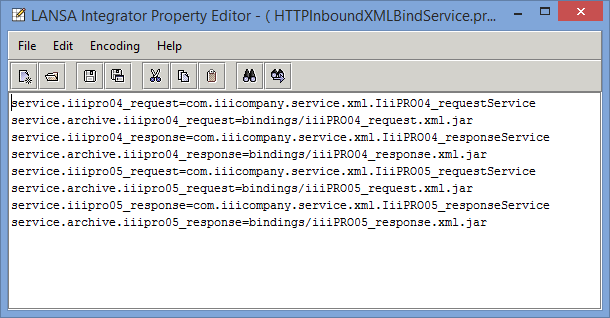 You have now updated the project section in the HTTPInboundXMLBindService.properties file on the server. 3. Deploy the jar files. You must now copy the jar files from your PC into the appropriate JSM server directory. You will send the jar files to the directory \instance\bindings. a. In the Server XML Employees Response folder, right click on iiiPRO06_response.xml.jar and select Send To / Integrator Folder from the pop-up menu. Select Yes when asked if you want to copy the file over. c. In the left panel, expand the Integrator / bindings folder. One at a time, right click on each jar file and select Publish File. Select Yes when prompted.